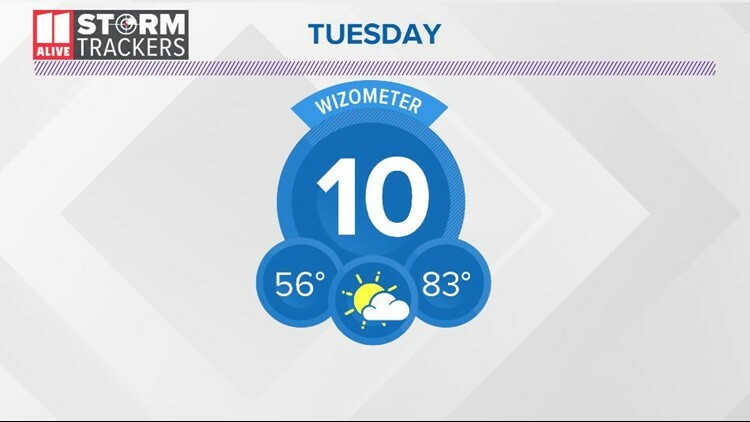 We will start the day on Tuesday with temperatures in the mid to upper 50s. It will be sunny and nice. Temperatures rebound nicely in the afternoon with highs back to 83 with sunshine mixing with a few clouds. We continue with that same pattern for Wednesday. A few clouds will mix with the sun and temperatures move into the low 80s. A few more changes come in on Thursday. More clouds will move in late. We will be tracking a system that is producing some rain to the west. Our rain chance will only go up to 20% late Thursday. The rain chance is higher early Friday. We have a 60% chance for showers early in the day. It is possible to have some thunder and lightning, but at this point, we aren't concerned about severe storms. Temperatures will be a little cooler Friday in the 70s. We will have partly cloudy skies for the weekend. Lows will be in the 50s with highs in the upper 70s and lower 80s.